I agree. But I have to say I have done this. When I lived in Coldwater, MIchigan, my property was very high and extremely windy. On the west side of the house I had a pair of weeping Redbuds flanking the porch and one winter the suffered a lot. So after that, I put up protection for them from December thru March. It was worth it. But not the best look. I think we’ve all done it… I’d be far more willing to do this for the sake of spring or summer flowers than for something like this that looks best in the winter. I live in northern New Mexico and deal with with strong wind, fierce sun, heat and cold. If a plant is delicate I’ll try to protect it with tougher plants, a low berm, or a rock wall or some combination thereof. But put up something ugly — IMO, no (except temporarily to protect fruit and vegetables from a fickle spring.) Winter long ugliness defeats the point — so my mother taught me 70 years ago. Well, I will wrap a young tree trunk. Good point — You can always use plants and walls to get this kind of protection without the ugly factor. Yes I would put something up to protect the plants, ugly or no. Howsomever, that wall they put up? I would paint a tree or plant or some such scene on it. Then it wouldn’t be ugly. or I would put winter hardy plants at it’s base AND make it tall enough to shield the entire plant. Sew pockets on it, put in air plants. Are antidessicants no longer considered effective? Or is this plant injured by factors they don’t protect against? 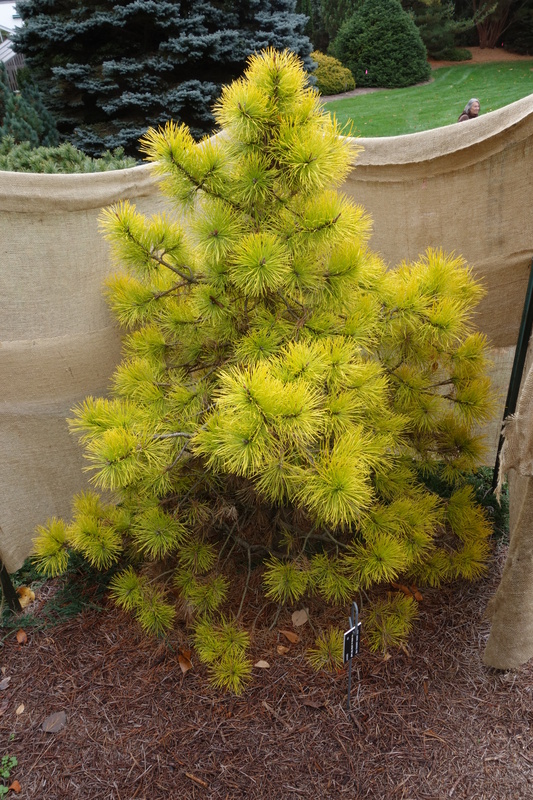 In northwestern Washington, I pulled out a rose garden and replanted rhododendrons, conifers, and trees that are attractive all year long for that very reason. Who wants to look at dead sticks all winter long? “Are there plants you are willing to make your garden ugly to keep happy?”..
As a gardener my tastes are constantly changing and maybe slowly evolving. I have done the formal gardens, the English boarder and the hodgepodge in-fill. I am no longer possessed to try out of zone plants. These days my interests are moving towards creating ecosystems in my gardens. I can tell you that even though the plants are not as spectacular to look at, there is a calming sense about the place. When you plant natives, you attract native insects and native predators. My focus in now about providing “food and shelter” rather than colour and show. Insects good, spiders great! That said even tawdry native plants bloom for a while too. What I now lack in colour and flair I more than make up in complexity and stratification. I quite enjoyed watching the hawk balanced on my gutters, pulling apart a sparrow last summer. Gardening is about having vision and making it happen … whatever your vision it’s all good. 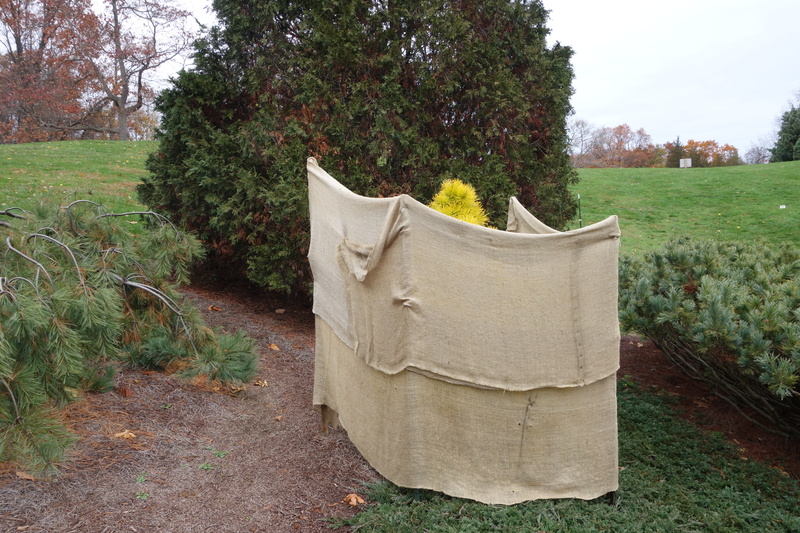 I agree that is ironic that we cover up our evergreens to protect them from winter winds and deer, when the whole reason, or at least half the reason, we grow them is to see the foliage in winter. A dilemma! 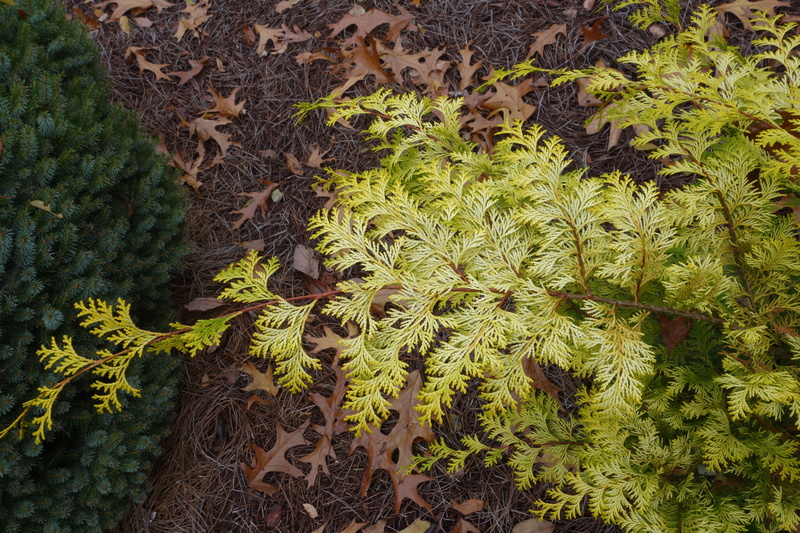 I agree with you- I just can’t bring myself to cover the beautiful boxwood or any other evergreen in the landscape. As an owner of a garden design/ maintenance business, we plant gardens for year round pleasure- this includes the garden in winter! The protection the burlap may give is not worth the diminishment of aesthetic pleasure, right? I agree with you but am currently guilty on two counts. I have a Meyer lemon in a pot in a homemade mini-greenhouse by the front door (protected southern exposure). It just isn’t happy inside, during the winter. I have ripe lemons, as I write. My other guilty pleasure is protecting my small fig tree with similar winter get-up. In my zone 8b in the Pacific Northwest close to Canada, I am pampering these two babies. Not sure I will have the patience for the long haul. It probably isn’t worth it, but for right now, I’m learning from the experience.